E and our Mardi Gras tree. Today is “Carnival” time in the New Orleans area, and lots of folks are packing up their Popeye’s Chicken, Tastee Donuts, soft drinks, and beer. They’re gathering up lawn chairs and ladders and heading out to the parades. Families will get to the parade route early to reserve a spot on the neutral ground where, regardless of weather, they’ll wait for hours for a string of floats, bands, and trucks …and catch trinkets to fill their grocery bags full of beads. It will be a circus-like atmosphere with street vendors hawking peanuts, selling cotton candy, candy apples, and corn dogs. Revelers will eat too much and drink too much before it all comes to an end at midnight tonight and the Lenten season begins. As a child, I thought Mardi Gras was a national holiday, considering everyone is off of work and school kids have a three day holiday. With anticipation, I would dress up as a gypsy, a cowgirl, or cheerleader. 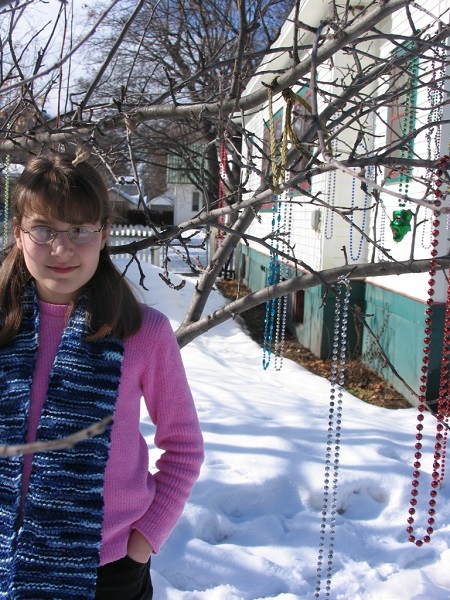 Often, my family and I would brave damp, chilly temperatures, and hang out all day with relatives where cousins compared doubloons and counted strands of beads. Trinkets were made in Japan back then, and it was a treat to catch a fan, a back-scratcher, or a giant plastic toothbrush. If you were lucky, a float rider would single you out and toss you a stuffed animal. Now that I’m a Montanan, I don’t miss Mardi Gras at all. But I do want to keep the tradition alive for my daughters who were born in Louisiana, but have fading memories of its culture. Each year to symbolize the holiday, we decorate a tree with beads. Beginning on Twelfth Night, January 6th, it sits in the cold and snow reminding us of our roots. Tomorrow, the beginning of Lent, we’ll remove the beads and store them until next year when we decorate the tree again. One last note; the people of New Orleans know how to throw a party! Better than anything I’ve seen in Montana. And for the record, it’s the out of town tourists who show their breasts for beads, not the locals. Mardi Gras, New Orleans Roots M and E, Mardi Gras, Montana, rocky mountain kids korner. permalink.